Kathy helped J & L select paint for their home and in their words, “Every color is absolutely perfect!” Kudos to Kathy on exceptional customer service, and thanks to J & L for sending such a nice note. We’re sure you’re already aware of what a treasure you have in Kathy Basil but we just wanted to let you know how happy we were with her work and what a great representative of your company she is! While we’ve remodeled a lot of homes and bought a lot of paint, this is the first time we had a “color consultant” come with our painter (Edgar Gomez–New Century Construction–aside—a superior painter with an amazing crew). We are used to buying about 50 versions of the same color to finally arrive at just the right hue. Kathy is able to quickly narrow down the choices and make the whole process a lot more agreeable! On top of that, she presents colors that one would never have thought of …and they turn out to be absolutely amazing! I could go on and on about each of our color choices but in the end, she helped us with paint for at least thirteen different rooms + hallways, trims, stairways, etc….The idea of repainting this whole house (that had previously been filled with wallpaper from the ’80’s) was daunting but Kathy skillfully, creatively, patiently, and cheerfully steered us to just the right colors. 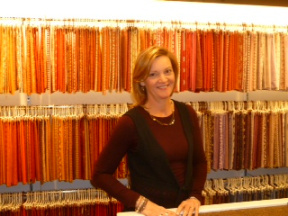 With her expertise and intrinsic sense of color, she facilitated this process to the ultimate degree. Suffice it to say: Every color is absolutely perfect! Whether it’s the kitchen, the work-out room, the bathroom, our bedroom, my office, the living room, etc, etc…. On top of all this, we weren’t the type of clients who just threw ourselves into Kathy’s hands. We had our own ideas, we had “experience,” and we were a little skeptical, knowing how hard it is to choose just the right color. Kathy was wonderfully patient with us. She expressed her ideas, respected our ideas, and explained what was good and bad of the two. So this summer, we will be painting the exterior of our “new” house and you can be sure, we will be asking that Kathy come back and find us just the right shade of “beige” or…what ever color she recommends. So many thanks for the professional guidance you provided us through Kathy. It is so fantastic when we get testimonials like this- shows just who is doing the job! Congrats!